Sangamon Reclaimed has received, for the second consecutive year, a mention on Business Honor Roll for the Good as Gold Springfield Volunteer Awards for our Flags for Heroes initiative and additional work in the community. The ceremony takes at the University of Illinois Springfield on April 24th – we’re looking forward to celebrating! It goes without saying, Sangamon Reclaimed would not be where it is today were it not for the support of our customers, family, and friends – so thank you, all. We are very excited to announce that we are now local supplier for Leatherneck Hardware. 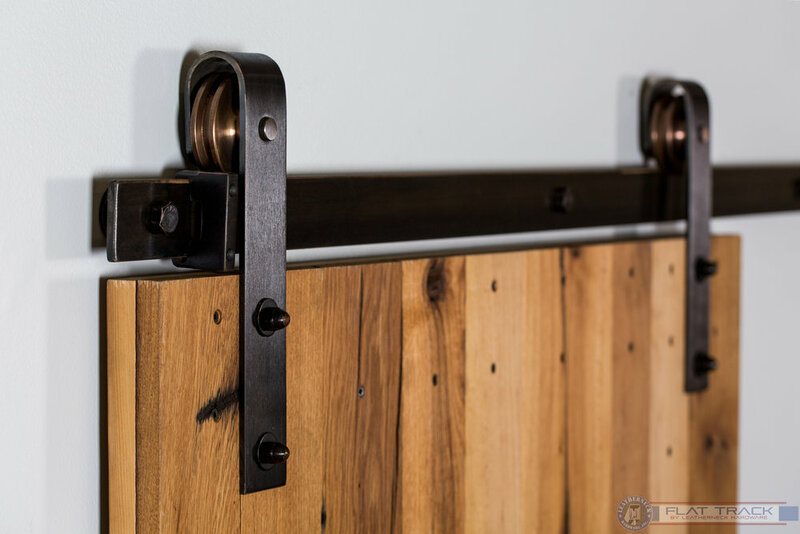 If you’re looking to add a custom-built reclaimed barn wood door to your home or business, you won’t find anything better than Leatherneck Hardware because we only use the best. Hanger styles are available in steel or quiet steel. The steel wheels are precisely machined and feature sealed ball bearings that are lifetime lubricated. Finishes include black, brushed nickel, antique bronze, and clear coat to name a few. Ask us for more information. You may have already heard, but we were super excited to receive the Best in Show Award for the 2019 Home Expo. This award is selected by attendees, which makes it all the more special. So, we want to take this opportunity to thank everyone that attended and voted for us! A year on, our live edge bar height table at Free Press Coffee House on MacArthur Blvd. in Springfield is looking as good as the day it was delivered. The owner, Jane Ann Petty, discovered us after we worked with her sister-in-law Sarah Petty. “She and her husband built a new studio for their architecture and photography business and had a beautiful island crafted by the team at Sangamon Reclaimed,” said Jane Ann who also owns Free Press Coffee House in Pittsfield and the William Watson Hotel in Pittsfield, Illinois. The table takes center stage at the coffee house. The caramel, coffee, and chocolate tones of the smooth top and steel legs contrast the industrial concrete floor and surrounding interior, which includes stained glass windows, floral wallpaper, and white marble countertop. We pride ourselves on our customer service and enjoy getting to know our clients, which include taking the time to explain the full range of products on offer and show them around our workshop. “The guys took me into the workshop to look at other pieces and we talked about different legs; walking me through every option. They made sure we had something that matched with the rest of the space. They are just great. “I love the fact that Sangamon Reclaimed is locally owned and operated. I also love the fact Brian and his team support veterans and first responders through Flags for Heroes. We loved working with the Illinois Environmental Council (IEC) to furnish its new downtown office in Springfield, Illinois. Director, Jen Walling, and her team are transforming the IEC’s new home at 520 E. Capitol Ave. into an environmental community center. Our tables were handcrafted using 2x12 antique heart pine floor joists salvaged from the Colfax Hardware Store circa 1893 (Colfax, IL). 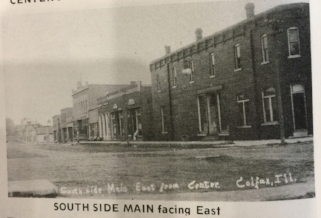 “The Illinois Environmental Council bought its first building in Springfield after 45 years of renting in the community. This opportunity was so special for us and we wanted furniture that matched our values of sustainability. We were so excited to find Sangamon Reclaimed. Sangamon Reclaimed came into the building and proposed tables for our common area made out of reclaimed wood that fit into our budget. The tables are gorgeous and functional and are the exact centerpiece that we needed to celebrate the space and our commitment to sustainability,” said Jennifer. We are excited to launch a new product for commercial and residential use with a range of applications from accent walls to decorative ceilings and cabinet cladding to so much more. The beauty behind our reclaimed wood paneling is that you get the saw markings; nail holes, and other signs of wearing, but the quality of the material is second to none because each piece has been hand selected by experienced craftsmen and planed, straight lined, and trimmed. The reclaimed wood paneling has also been heat treated at 140 degrees and kiln dried to 6 to 8% moisture. For more information speak to one of our experienced craftsman. We are excited to be working with the Illinois Environmental Council (IEC) to furnish its new downtown office building in Springfield, Illinois. We look forward to seeing IEC executive director, Jen Walling, and her team transform the IEC’s new home at 520 E. Capitol Ave. into space that will become an environmental community center for Springfield. Our tables will serve as collaboration tables and are handcrafted by our team using 2x12 antique heart pine floor joists salvaged from the Colfax Hardware Store circa 1893 (Colfax, IL). IEC will also display information about this structure to help us pass on the history of these pieces to future generations. The IEC, a coalition of 80 organizations, was founded in 1975 and serves as the environmental community’s eyes, ears, and voice in Springfield. Protecting Illinois schoolchildren from exposure to lead in drinking water, reducing health risks and environmental impacts of pesticides and funding open space acquisition are just some of the accomplishments of the IEC to date.